Original Editors - Laurien Henau as part of the Vrije Universiteit Brussel's Evidence-based Practice project. Top Contributors - Laurien Henau, Claire Knott, Rik Van der Hoeven, Kim Jackson and Wanda van Niekerk - . 1 What is a bone bruise? A bone bruise is a type of bone injury. Other examples of bone injuries include stress fractures, osteochondral fractures and a variety of different patterns of bone fractures. A bone bruise is characterised by three different kinds of bone injuries including: sub-periosteal hematoma, inter-osseous bruising and a sub-chondral lesion, or a combination of these. A bone bruise is differentiated from the alternative fracture types in that only some of the trabeculae are broken. Bone tissue is a specialised form of connective tissue that is made up of an organic matrix (collagen and glycosaminoglycans) and inorganic minerals (calcium and phosphate). An adult human skeleton contains 80% cortical bone and 20% trabecular bone. 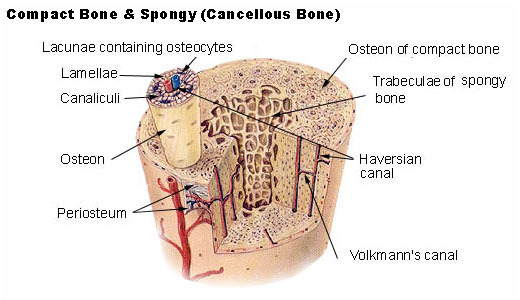 Both types of bone are composed of osteons. Cortical bone is the solid type of bone and trabecular bone resembles honeycomb which is comprised of a network of trabecular plates and rods. 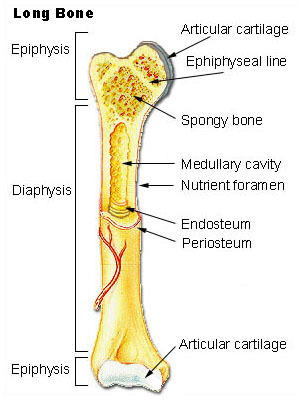 Read more about the histology and physiology of bone here. The most common cause of bone bruise is trauma however the condition can also be associated with normal stress loading and haemophilia A and B. In patients with ACL rupture there is an 80% probability of concurrent associated bone bruising at the femoral condyle or tibial plateau. According to Boks et al. 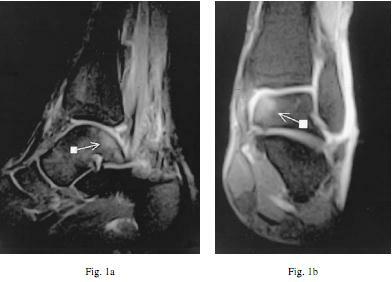 2007, the presence of bone bruising in these zones is the most important secondary sign in the diagnosis of ACL injury. 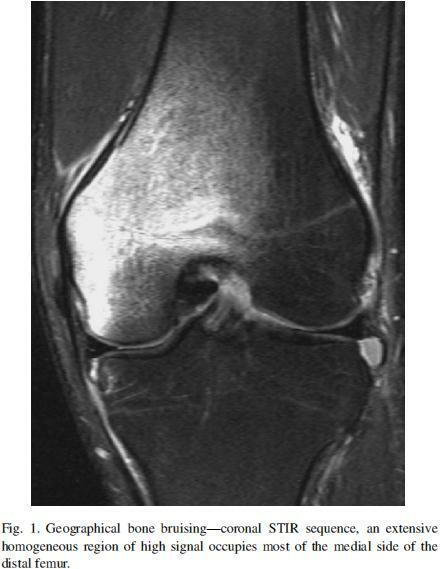 MRI with white arrow indicating presence of bone bruising in the (a) post-lateral talus area and (b) the caudal tibia epiphysis. Inter-osseous bruising Damage of the bone marrow. The blood supply within the bone is damaged, and this causes internal bleeding. Repetitive compressive force on the bone (extreme pressure on regular base). Force causes separation of the cartilage (or ligament) and the underlying bone, plus bleeding when the energy of the impact extends into the bone. Although an x-ray should identify whether or not there is a bone fracture, a bone bruise is not able to be diagnosed using x-ray imaging. 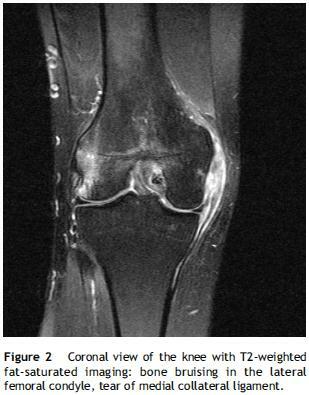 The current "gold standard" diagnostic imaging method for bone bruises is the MRI, in particular T2-weighted fat-suppressed images or T1-weighted imaging. The treatment of a bone bruise consists of RICE, pain relief and/or anti-inflammatories as prescribed by a medical practitioner and load restriction dependant on the circumstances of the injury. The time for the resolution of a bone bruise is variable. Literature suggests that the healing time to completely resolve this injury can take anywhere between three weeks to up to two years after the trauma.